Thank you for looking over all the websites I’m still working to develop into an appreciable platform that looks out for the developers & teachers in a publicly-beneficial & economically-viable, rights-respecting manner. There’s still much to be done, but as you can see Wild Willpower is designed to become a very large platform (WildWillpower.org, websites, documentaries & publications) able to be built upon by many people, native teachers, mushroom & lichen experts, web development teams, editors, writers, documentation crews, wildharvesters, graphic designers, are provided ample funding so that we may collectively build Wild Willpower into an effective set of educational tools for generations to come while maintaining our principles. That said, all the content thus far has been typed & designed single-handedly by me. These sites would not be possible without the life’s work of many others, but as for content, I am still typing & doing graphic design nearly every day until those with the creative force, $$$$, AND hearts who want to be a part of this contact me & make this happen. Richard Lonewolf Survival School AND Wild Willpower’s immediate needs include $1000 so we may get More Valuable Than Gold printed & an additional $2000 so that we may get the outdoor gear & documentation equipment necessary for developing our next book & DVDs we have planned. Just as with our first DVD, The Forgotten Abundance of America’s Wildlands, as we get them produced, several scenes will be available to everyone for free online. This is a way we can really benefit the public & also provide a valuable product to help Richard Lonewolf Survival School teach many more for generations to come in a way where every purchase also helps to support the continued works described throughout www.WildWillpower.org. The more we grow, the more opportunities for humanity that will become available to humanity via solving important resource & economic issues gracefully & abundantly. Why Not Just Keep Documenting & Give the Knowledge for Free to Help Humanity Since That is the Purpose? Many have suggested that Lonewolf & I just keep documenting everything we can & putting it online for free because it will help everyone & that is the real purpose, but that will not work because I am obligated to make sure that Richard Lonewolf & Richard Lonewolf Survival School are being allocated for so that I am not stealing; I personally believe this is important because on a broad spectrum I think its “more ethical to pay native teachers to teach than it is so only pay them if they’ll run casinos”. I’m all for the casinos, but culture is worth honoring & these skills are needed by humanity as more than mere entertainment. These skills are vital to our continued survival on this planet & the knowledges within the scientific realms of ethnobotany & ancient tribal living skills are going to enable our species to avert worldwide ecological collapse AND economic collapse gracefully in unexpected ways as you will see in the coming months & years. Below I’ve compiled a list of “Frequently Asked Questions” along with my responses. 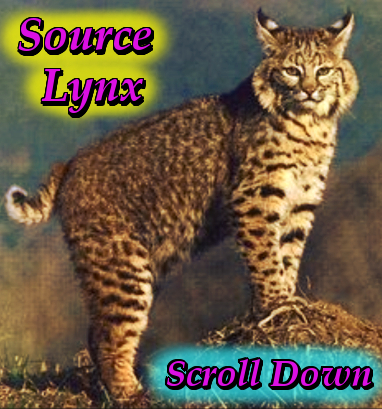 I expect to update this page & questions come in (Distance@WildWillpower.org), & you can expect WIld Willpower to become a more & more useful of a resource with each passing day. Our most immediate needs include $1000 to be able to afford to get More Valuable Than Gold off the printers, & an additional $2500 or so to get the initial gear required so we may continue documenting with Richard Lonewolf as soon as possible. He would like to do 4 more DVDs this year. We recorded The Forgotten Abundance of America’s Wildlands with barely any resources & I edited it on a smartphone– it was the only thing I had access to. On May 8th, 2015 we received our first $500 donation via Paypal. I ask that if you would like to see WIld Willpower grow further & help your life more & more to please consider donating via Paypal to the email address adraghastar@gmail.com. Why is Wild Willpower designed as “a PAC teamed up with A Peaceable Assembly of Civilians” rather than as a Corporation? I want to explain Wild Willpower​ & Richard Lonewolf Survival School​’s top priority needs & setbacks & “why we’re going about things the odd & unique way that we are” in a letter “to the world” to give people a better idea of what we’re looking at & why Wild Willpower​ & I are acting like we are. 1.) The World Benefits Greatly When Wild Willpower​ documents with native teachers (& anyone can join Wild Willpower– its a matter of being the right person for the job because its a lot of work like flying a spaceship & you need to know which lever to pull when an asteroid comes flying by, for instance). When I filmed The Forgotten Abundance of America’s Wildlands w/ Richard Lonewolf​, I was in turn able to put up SEVERAL videos on Youtube to share with YOU & anyone you know– for free– without ripping off Richard Lonewolf​. ALSO he’s got an original DVD that Wild Willpower, the “peaceable assembly of civilians”, published & that he can sell for his school. I’ve been donating my services to “peaceably assembly” his website & productions at no cost & I would like to help train others to build websites using similar templates so that WIld Willpower can grow & help many other documentation crews & deserving & credible instructors– mushroom experts, lichen specialists, & others as well. With each DVD we produce for the teachers, SOME of the footage– maybe with 5 or vids or so– will be put online. This is a way we can help teachers, help kickstart new documentation crews operating for noncommercial purposes with regard to The Bill of Rights, for instance, & ecosystems, & animals, etc., & also help the teachers & provide them will a special product for those who really want to know more & get involved. 2.) Some of the things we need include better gear AND the ability to charge our electronics, store more data, & manage the school from out there int he woods. This means we need portable satellite technology & to be able to afford the gear throughout www.RichardLonewolf.com so everyone involved may travel lightweight & rent-free– making this a low-cost endeavor. We’ll be teaching people about fire safety & sustainable harvesting for First Amendment purposes & showing how proper wildfire prevention techniques BEFORE starting a SMALL fire using traditional ancient skills means burning off deadwood in a controlled manner that protects homes AND helps us to provide for our energy needs without having to mine for it– saving time energy & money by simply “using what The Creator put there”. 3.) We still have Richard Lonewolf with us, & its important for me that Richard Lonewolf Survival School becomes successful while he is still here on the planet to see it happen & so that he can pass something onto his family & to the world. We never know when our loved ones are going to pass, & we never know when we might lose an elder or great teacher “we wish we’d listened to more while they were still alive”. 2 of my lovers have passed away in the past 5 years, & several others have gone as well– at the young age of 33 perhaps I’ve seen more than many my age which led me to this unique path which before success has led me to a path of advocacy moreso than activism. I’d rather not rub people the wrong way– I’d rather be straightforward, introduce myself & intentions, & embark on endeavors with understanding from people rather than distrust. 4.) I built Wild Willpower as a political action committee that does not make its decisions from a commercially-centric perspective, which is why we are noncorporate while considering both economic & non-economic related factors. Economics is like a Rubix Cube to me– I tried to toss it out the window before & not deal with it but it is definitely part of this puzzle called life because without it I may not be able to feed that homeless person or give them medical care int eh way that an all-connected economic system can, however I am also a vegan & I don’t fit into the current societal construct because of my beliefs, but I’m also an American & care to respect peoples’ different was of living, & so that is where both www.KernRiverCoop.com comes in as the type of business I emotionally COULD be part of wholeheartedly in a way that contributes to society. www.TribalLivingSpaces.org is another end of the deal– a plan to acquire land for people seeking to live this way so we can generate as much abundance as possible & begin sharing it with the world & replicating our successes in a mutually-beneficial way without the economic juggle/dance. I don’t consent to joining the corporate takeover I’ve seen across this country hitchhiking where local officials outright ignore peoples’ rights in favor of economic interest. Its undermining the laws of the nation via violating the rights of the people & I do not consent. 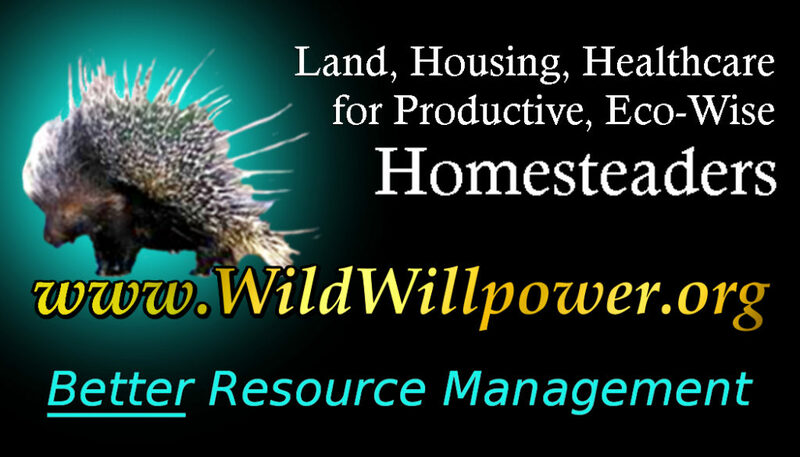 Wild Willpower is a political action committee not a corporation, here to help advocate where need be & educate where able & begin living sustainably so that humanity has that option from here on out. Please help us with supplies by donating via PayPal​ to adraghastar@gmail.com & I’ll keep making the websites better & better & walking the walk without complaint on Earth as it is on this awesome Earth. Below this line is unedited. “I first met Lonewolf over 9 years ago on the land merge between the high deserts of the Mojave & the resource-abundant & heart-inspiring Sequoia National Forest. He & his family invited me & 3 of my friends into their home, & we began to learn- for the first times in our lives- an authentic perspective of what it meant to be a native whose ancestors lived in mutual benefit with the wild ecological bioregions that are now known as The United States of America. Nothing was watered down. Getting to know Lonewolf certainly didn’t keep me “safe” from the reality that “what happened to Native Americans” is not “a thing that happened in the past” as textbooks, teachers, friends, & family had led me to believe & also believed themselves. To learn from a man who holds the conviction of a tortured, proud, humble, & righteous people in both of his eyes & in all of his songs & stories has brought me to tears more than once. At times, these tears have bled from my eyes as I laid upon the desert floor until the pain & lies & sorrow seeped out & away from my very being. They are no longer part of me. What is left of the “me” that you will now meet is merely an advocate & ally to the native peoples of these lands, & a friend also who has not forgotten where she came from, but instead feels honoured & grateful to be able to bring great gifts of wild natural knowledge to a nation sorely & sadly lacking in “the way of the plants & in the way of our ancestors”. Years ago just beginning to learn & having a strong desire to live among the wild. In front of Von’s at the shopping center in Ojai. 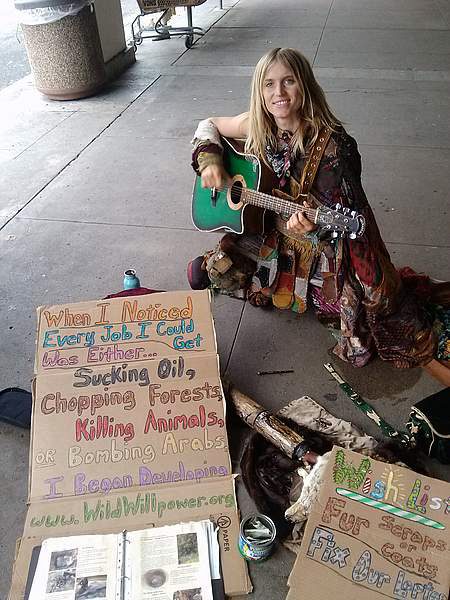 The sign on the left reads “When I noticed every job I could get was either sucking oil, chopping forests, killing animals, or bombing Arabs, I began developing www.WildWillpower.org. Underneath this is the wild living skills book I’ve been working on with Lonewolf. The sign on the right is a “Wish List”, that has moved HERE. Since 2010 I’ve been at the computer, out in the forest, or out not he streets performing in order to continue building WildWillpower.org, WildLivingSkills.org,RichardLonewolf.com, & OurlLandsToo.org, & have also produced an improved version of Richard Lonewolf’s Wilderness Survival Manual from 1987 AND “The Forgotten Abundance of America’s Wildlands w/ Richard Lonewolf” (DVD & booklet), as well as several other related projects still in development. I am here to help a 62 year old man who has invested his life since was only 8 to recovering the traditional wild living skills of all Native American people. He has gathered them from books written in a foreign language from his own tongue, walked among the deserts & the mountains to bring vague descriptions of “how natives used to do things”, & then touched the plants on a journey of rediscovery, making mistakes as he “excavated” these forgotten skills up until the point where he is now able to simply walk people through the wilderness & rattle off about 20 practical uses for nearly every biological organism! He has taught me amazing cooking techniques, how to purify water using an Oak tree, & knowledge of the traditional medicinal system of his people that still today continues to develop & be handed down through word of mouth as it has been for thousands of years, & so much more as being shown on www.WildLivingSkills.org, which has only begun to surface. Richard Lonewolf is more to me than my teacher. He is a REAL AMERICAN HERO!!! This is the header I made for him on www.RichardLonewolf.com. Pretty beautiful how a little practice using the free graphic design program called GIMP can really bring what a person sees in their head onto the screen for others to “see through your eyes”. I am here to help a proud veteran who defended his ideas of what this nation means to him & his people so that he can fulfill his destiny to bring The Great Lost Red Road to The Good People of The United States of America, & to all Native People who still look out their car windows into the forests & wonder “what it would be like” to live as their people thrived not long ago. I am here because I love nature, & I believe humans have the RIGHT to live wild & free! 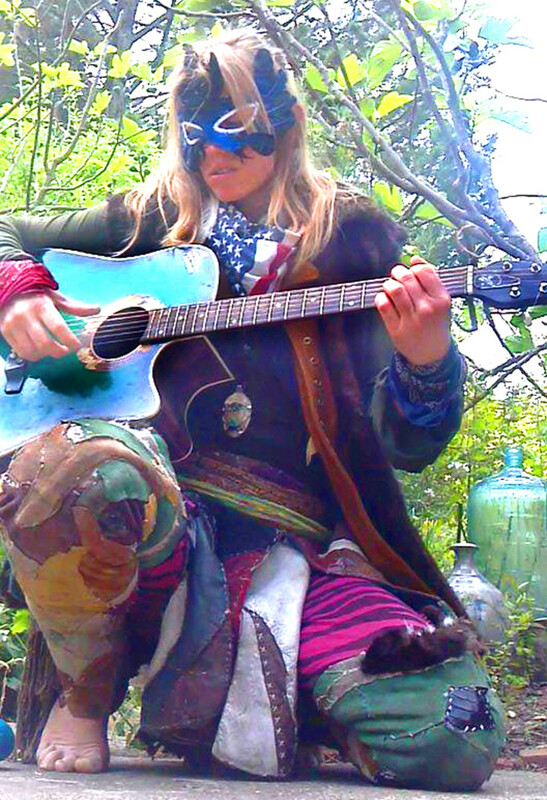 Richard Lonewolf has helped to transform this curious & passionate hippie into a force of nature! I am now a BARD!!!! 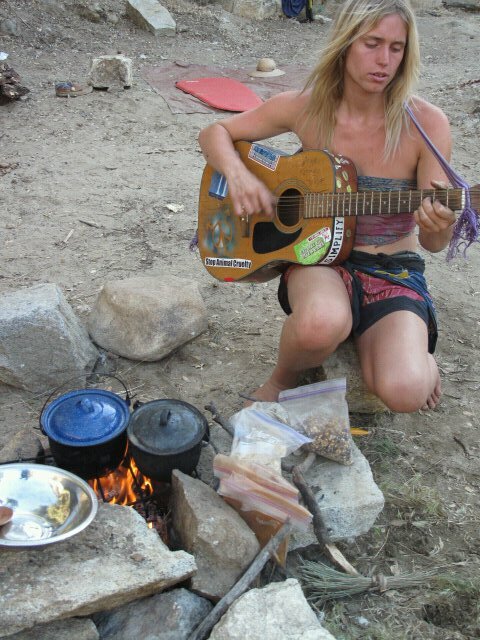 Lonewolf taught me to craft all-weather outdoor gear using traditional techniques that have been used by native people throughout the planet for thousands of years to that they could stay comfortable in even extreme conditions (I’ll give you a tour & teach you to craft your own soon!). I became a vegan over 12 years ago after choosing to stop killing animals because of my personal beliefs, however, after learning from Lonewolf I now utilize the parts of animals after they have died. Each patch on my gear is sewn together from the bodies of animals who were robbed of their natural wild & free life before they were born so that they could be exploited by industries, & also from animals who were hit by cars & were left voiceless to rot away on the side of the road. I am now a voice for these animals, & I sing for their freedom to people wherever I go! THAT is what I call “Honouring the Animals” & “Paying Respect”! I am an Animal Freedom Artist! I am a now a BARD!!!! I barely used computers at all following the September 11th attacks for over 7years, but after learning all these skills & trying to “lure” people to the woods unsuccessfully, I had an epiphany that made me realize the only way people are going to be able to access this knowledge is if I “take one for the team”. August 7th was my 11th year “on the road” hitchhiking & street performing to make this possible. I’ve been attacked, screwed over, robbed over 16 times, had bottles thrown at me by jerks who were driving by, & stayed alive because I was able to supplement my diet with little green things front he roadsides. I crouched down low & peered hard into the eyes of dead animals who laid lifeless on the roadsides & promised them from deep inside my heart that their voices would not be drown out by the incessant drumming of motorized vehicles without The American People hearing from ME. I say– if you’re not representing the animals by living in a good way upon this planet with them, give your furs & leathers to someone who IS, because to REPRESENT someone is to be a lawyer, & I am here to “Sioux” ALL OF YOU!!! What I ask in return? Pick up hitchhikers. Do your best to live in a good way with people, animals, & the planet whatever your circumstances may be, & drop something into the guitar case of a lowly street musician. Be good samaritans, & do not let the length of a man’s hair or the cleanliness of his body determine the manner in which he is treated. Be good to people all all classes & creeds. We are truly here to love & to help each other. For the first 6 months after we began staying with his family, I began learning to take my needs from the Great Earth Mother humbly & among, picking carefully from each plant so that it was only benefitted by way of harvest. I believe that I could not have learned from any university what was taught to me in my heart by the whispers of the silent & vast desert, nor could any biology class have given me hands-on experience, nor any culinary class have offered such flavors as the wild riches of these ancient, & long-since-touched lands. 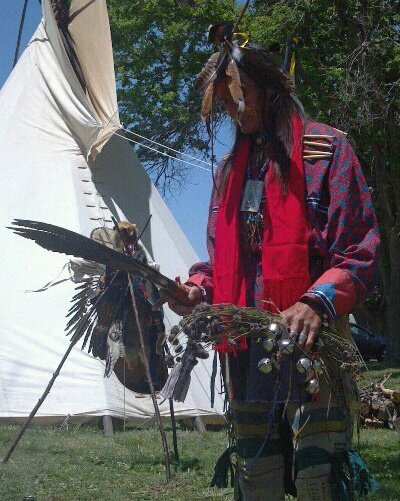 We engaged in Sweat Lodge ceremonies nearly every day, & in the Peyote Ceremony that we had, my teacher, friend, & chief, Richard Lonewolf, gave me the name Running Eagle. After our initial 6 months, I hitchhiked to L.A. to attend The Children’s Hospital of Los Angeles. During the year & a half I spent (invested) living on the streets of Santa Monica, I was able to harvest about 80% of my food from plants I would pick from between sidewalk cracks & roadsides from Venice Beach up through Malibu; Aloe Vera, Dandelion Greens, Lemon Flower, Nettles, & others. I ate chia seeds from the local cooperative (Co-opportunity), & continued eating in a similar way to how the desert had fed me during my time there whenever I would purchase something. 8 months into my time at the children’s hospital, I was asked by a nurse there what I was eating, & was told I was “The healthiest person in the hospital” & that my blood looked “incredible”. After telling them how I was eating, Alexis Rivera & Sabel Simone- my case workers at the time- suggested that I teach a class to the fellow patients & staff. The class was called “Healthy Transitioning”, & I was grateful to have the opportunity to teach several AIDS patients & also several fellow young transgender women about the option that we all have to eat in a way that is much more similar to how our ancestors ate. For a minority group (the class was mostly transgender patients) riddled in poverty & prostitution as an only means for survival, it felt a great honour to share information that mid-urban people rarely have access to. I couldn’t have done any of this without first meeting Lonewolf because I simply wouldn’t have had had the knowledge to do so. 3 1/2 years later, I would return to him. I would not know him to be my chief until many years later, when I would return to him following the death of my lover & friend, Professor Frank Schiavo, Environmental Studies Professor at San Jose State University on January 26th, 2010- my birthday- following my return from Kauai. It was there, after listening to stories from some of the native people & through life reflection, that I realized when i returned to the U.S. I would need to find Lonewolf & learn from him with deeper commitment than I gave the first time. He was living in Bakersfield as a single father who was about to get evicted & who was not receiving his due medical benefits. He had no teeth he claimed because he was among soldiers who were made to brush their teeth with depleted uranium during 1942. “The only reason I believe I’m alive today to tell the story is because I know the herbs,” he told me. Thanks to having some experience in graphic design after 4 years as the online editor of our high school newspaper at Nevada High School in Nevada, Iowa, (thank you Mr. Phillips!) I was able to make him a business card & a flier before the Pow Wow, & also scan, clean up, & improve his WIlderness Survival Manual from 1987 (now with beautiful photos!). I also found him a lawyer to try to help him receive his medical benefits (he’s apparently still working the case), & thanks to the sponsorship offered by Ashawna Hailey, was able to begin documenting his skills in the lower Sierra Mountains with the help of a smartphone that made this website & WildLivingSkills.org possible. Her sponsorship helped us pay or gas, paid for my Sony Cybershot camera/camcorder, & also helped me to give him something to feed his family so that the trade would be “washte“. 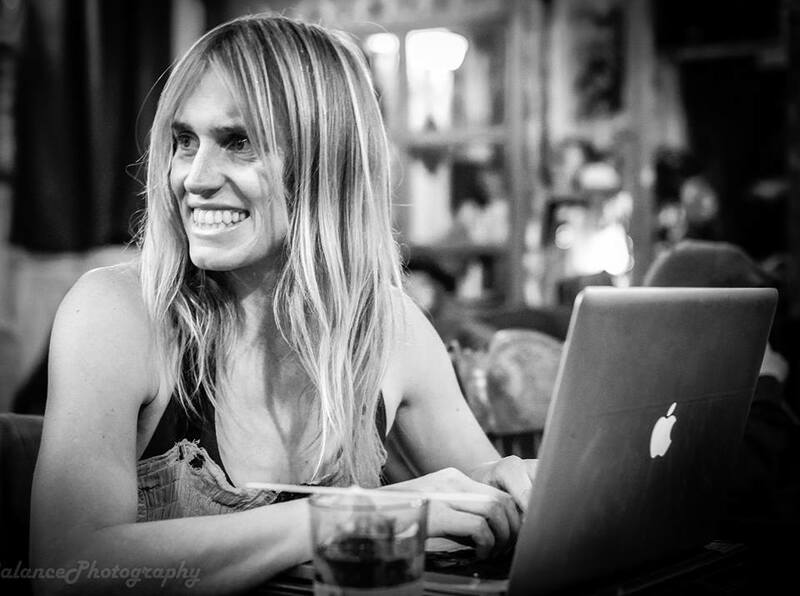 I felt like doing a lot of this would have been a lot simpler for a lot of other people because they could just go out & “get a job”, but at that time it had been 9 years of living “on the road”, & because of my beliefs could not take part in working any job involved with using animals for meat or milk. I know other people who feel the way I do regarding animals, but for me, compounded with the common violence or hatred I had experienced up to this point for having a transgender medical condition, “finding a job” just wasn’t possible. I was focused more on staying alive– I’m not going to get into a lot of details on that right now, but it will be in my biography. Ashawna went to the spirit world on October 14, 2011, which came as both a shock to me and to Lonewolf & his family. From that point on, what kept us moving forward was my street performing to earn cash & the kindness of Bill Hill of The California Lichen Society for letting me stay in his home while developing Wild Willpower (using the desktop computer that Ashawna had gifted me). While amidst what was feeling to be dire hardship in my life at many angles, I met my dear friend & lover who has been by my side since, Kevin Byrd. January 26th is the 4th Year Anniversary since the passing of Frank Schiavo. Please learn how he changed the world & help us pass his torch on!